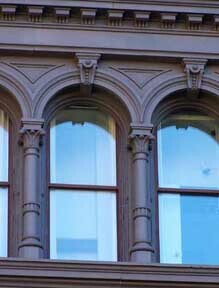 ...the three major types [of iron ore] are wrought iron, cast iron and steel. Steel is now the most important, but its production dates only from the 1850s. Cast and wrought iron on the other hand are processes which have been known for thousands of years, but it is only comparatively recently that technology advanced to allow widespread production. Good cast and wrought iron are much more resistant to corrosion and rusting than steel. Wrought iron was traditionally smelted at a relatively low temperature in the solid state to produce a spongey mass of metal called a bloom from which the impurities were driven off as liquid slag by hammering, hence the term "wrought" ie "worked" iron. It was much used for gates and railings, and for structural members, but the early methods of production, (the iron cooled quickly and could only be worked in small quantities) limited the size of parts which could be easily made. Long thin sections were impossible until the development of the rolling mill, which is still used in steel production, during the eighteenth century. The rollers could be shaped to produce bars of different sections for the smith, nailmaker etc and eventually patterned sections, which were known as fancy work. By comparison, cast iron, only produced commercially after the introduction of cupola blast furnaces in 1794, was smelted at much higher temperatures in the liquid state. It was then poured out (ie cast) into a mould to produce blocks traditionally known as pigs, because the line of individual blocks connected to a channel looked like a litter of suckling pigs, hence the name "pig iron". The high carbon content makes cast iron very rigid in compression, but weak and brittle in tension, even when red hot, so it cannot be forged or rolled. However it also lowers the melting point so it can be easily poured into moulds to produce complex shapes. Moulds were commonly made of a sand or clay mixture. It can be difficult to tell wrought from cast iron. 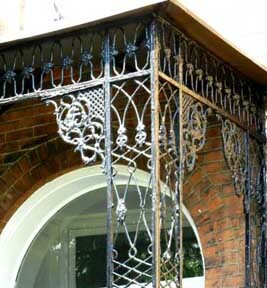 Generally, wrought iron is more delicate and is employed for the more fantastic shapes. Cast iron is usually chunkier and as the process would suggest occurs where detail is repeated. Corrugated iron was invented in London in 1828 by Henry Robinson Palmer. It involves a rolling mill process, if it is stamped, it will have weak spots. When heated, it [wrought iron] could be skillfully hammered and stretched, artistically twisted and bent into the desired shapes by individual craftsman. Today, what is commonly called wrought iron is mild steel bars which are heated, then "hammered" and bent into shapes ...frequently by machines...to mass produce scrolls, twisted bars and the like, for assembly into finished items. Cast iron gained great popularity in the United States in the nineteenth century, because of it's suitability to the lower-cost mass production process... in a time when wrought iron was still an individual hand craft. carefully prepared for accurate reproduction. Since these molds can take virtually any shape, restricted only by the talent of the patternmaker, the range of cast iron products and castings is practically unlimited. There are many differences between iron and steel. Primarily, iron is an element while steel is an alloy comprising of iron and carbon. However, in this alloy iron is present in a greater quantity. You can add various other metals to steel so as to produce alloys that have different properties. For example, if chromium is added to steel, stainless steel is the product. It is durable and doesn’t rust easily. In the construction industry steel is used on a large scale. This is because steel is stronger than iron and it has better tension and compression properties.